Neal leads the BTCC pack away from the grid at the start of Race 1 as chaos ensues behind him. Matt Neal has won the 2011 Dunlop MSA British Touring Car Championship after coming out on top against his Honda Racing team-mate Gordon Shedden in a nail-biting final race of the season at the Silverstone circuit in Northamptonshire yesterday (Sun 16 Oct). In front of packed grandstands at Silverstone, Neal lifted one of motor sport’s most prestigious titles in the world for the third time in his career. 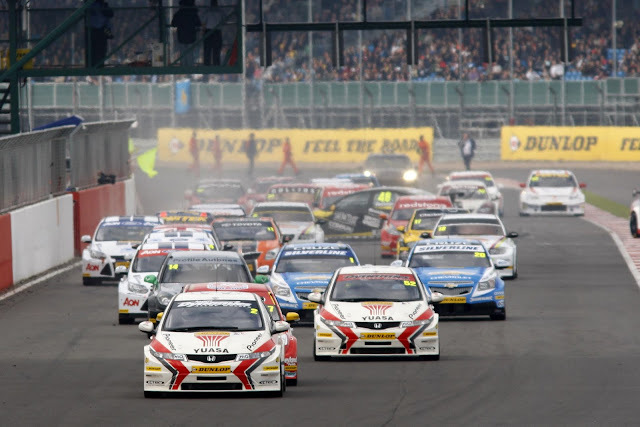 The BTCC also ended on a massive high with a record 30 cars appearing on its grid. 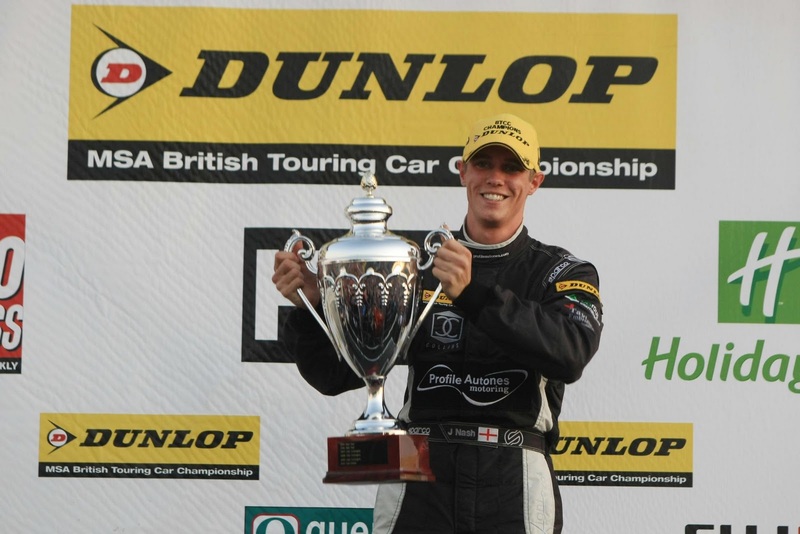 Worcestershire’s Neal won yesterday’s first race from pole position ahead of Fife’s Shedden. Buckinghamshire’s James Nash finished third in his 888 Racing with Collins Contractors Vauxhall Vectra to secure the Independents Trophy. Shedden then retaliated by winning race two ahead of Neal, their Civics chased to the line by Tom Onslow-Cole’s Team Aon Ford Focus. 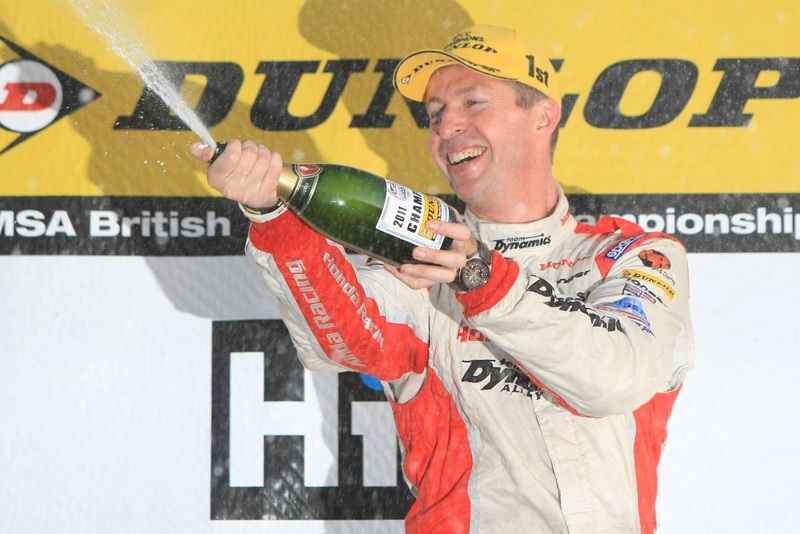 It meant Shedden was now just six points behind Neal heading into the day’s third and final race of the season. 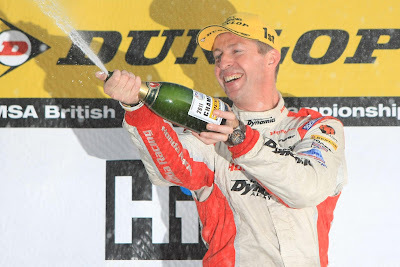 But it was to be Neal’s day as he finished the third race in eighth, two places ahead of Shedden, to add to his previous titles in 2005 and 2006 – also in Hondas and with the same Team Dynamics squad. The race was won by Tom Chilton’s Team Aon Ford Focus ahead of 2010 Champion Jason Plato’s Silverline Chevrolet Cruze and Tom Boardman’s Special Tuning Racing SEAT Leon. Plato plus Nash and Airwaves Racing Ford Focus driver Mat Jackson had also all arrived at Silverstone still capable of winning the crown – the first five-way showdown in BTCC history – but by the end of race two each had fallen out of contention. 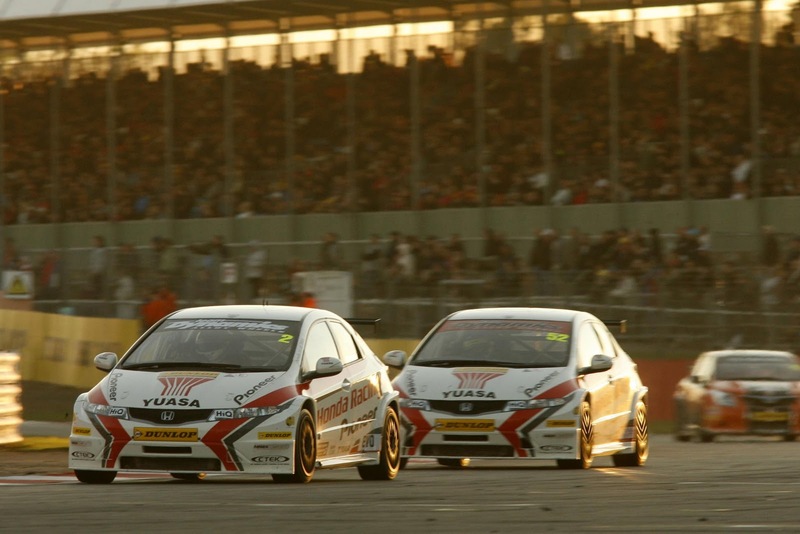 Meanwhile Neal and Shedden’s partnership has enabled Honda/Dynamics and the Honda Racing Team to comfortably win the BTCC’s coveted Manufacturers/Constructors and HiQ Teams championships. Nash’s 888/Collins squad has also won the Independent Teams Trophy. 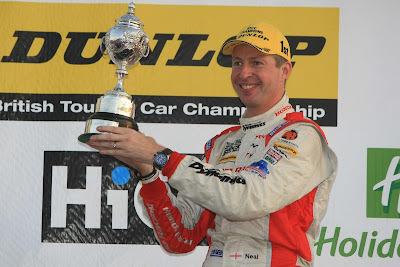 An ecstatic Neal, who at 44 has become the first triple BTCC Champion since Andy Rouse in the early Eighties, commented: “This has been the toughest of my three titles to win – the competition has been extraordinarily high and Gordon has been such a hard team-mate to beat. To have my name on the trophy for a third time alongside so many great names… I am overwhelmed. It means the world to me. “My pole position lap on Saturday, with maximum ballast in my car, was one of the best laps of my entire career and it set things up perfectly for me today. If I hadn’t won it I would have been disappointed for myself but over the moon for Gordon – he’s become like a younger brother to me and even though he’s only been in the BTCC for six years he is one of the absolute best out there on the track. James Nash lifts the Indepents Trophy. Newport Pagnell’s Nash, a rising star of the BTCC, was justifiably proud to have won the Independents Trophy in what has been his first full season in BTCC after part campaigns in previous years. Elsewhere at Silverstone, Frank Wrathall was fined £500 and had three penalty points applied to his competition licence for an on-track incident with Robert Collard. 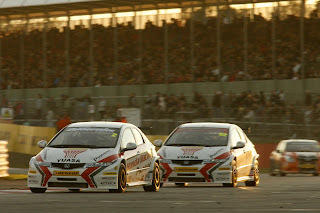 Both the WSR and AmD Milltek Racing.com teams were also fined £500 for failing to comply with officials’ instructions. Daniel Welch was excluded from the results of race three in the championship’s previous round at Brands Hatch after his car failed a technical inspection.